Nothing can be more frustrating than trying to detect water leaks without expert assistance. Even if you get a plumber to do the work, it’s still a hit and miss proposition. It’s bound to turn out more expensive than you expect. Manual leak detection not only wastes time and resources, but can cause damage to your property as well. Digging out a water leak can be very messy, especially if the pipe is hidden under concrete or under the ground. But the good news is, you don’t have to subject yourself to such a harrowing experience. There’s a cost-effective and hassle-free solution to your water leakage problems. It’s called acoustic leak detection. Water Leak Detectors offers the most advanced water leak detection services in Victoria. Using state-of-the-art equipment, they can easily locate water leaks in your home or property — with needlepoint accuracy. When high pressure water pipes spring a leak, water exits with so much force the pipes vibrate. This vibration is picked up by a sophisticated, sound sensitive device called Acoustic Leak Detector. With this device, we are able to accurately identify the location of water leaks without removing concrete or digging the ground. The closer the sensor is to the leak, the louder the sound gets. All we need to do is identify the position of the loudest leak noise. That is where the leak is situated. 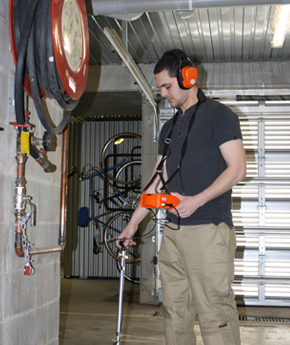 Our Acoustic Leak Detection service is specifically offered to help homes, workplaces and high-rise buildings. We are your one-stop solution to your water leakage problems. After your leaks have been identified and fixed, you can avail of our consultation services. We will check your property to ensure you are free from any further risks or hazards. Found any leaks? We’ll take care of those for you. Call us today at 1800 053 257.